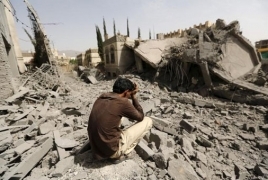 PanARMENIAN.Net - Yemen's Houthi movement launched a ballistic missile deep into Saudi Arabia and may have also fired on a U.S. warship, two days after an apparent Saudi-led air strike killed 140 mourners at a funeral attended by powerful tribal leaders, Reuters reports. On Monday, October 10 a Saudi-led coalition waging war in Yemen said it had intercepted a missile fired by the Houthis at a military base in Taif in central Saudi Arabia, striking deeper then ever before in the latest in a series of more than a dozen missile attacks. The Houthis, fighters from a Shi'ite sect that ruled a thousand-year kingdom in northern Yemen until 1962, are allied to Hadi's predecessor Ali Abdullah Saleh. They have the support of many army units and control most of the north including the capital Sanaa.